When I first got involved in OST, my motivation was practical. I thought that having some consistent record of weather and phenology patterns would ultimately be useful in my work in Forestry & Natural Resources Extension. I wasn’t quite sure exactly how it would be useful. But I figured that since weather affects trees in many ways, something would come of it; and even if not, I would be helping scientists with THEIR research questions. Current year needles were stunted and had curled, dried tips. But the terminal buds were sound. Recently I put my data to use when a puzzling Douglas-fir sample came into the office. None of us had ever seen anything quite like it. 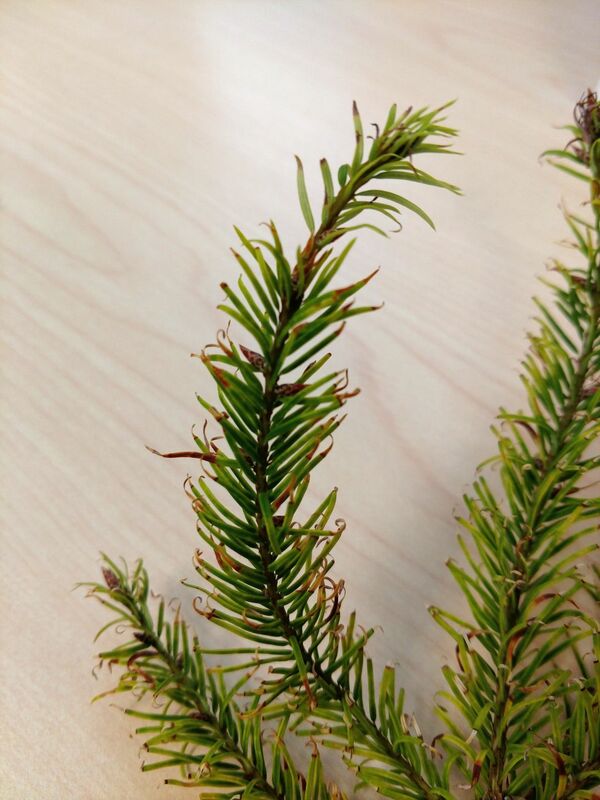 The current-year needles were stunted, curled, and dried out at the tips (see photo). It sort of resembled light herbicide damage, but the landowner affirmed that no spraying had been done around these trees. Only a few of the landowner’s many trees were affected; but of the ones that were, the symptoms were present all over the tree, on the current-year needles only. The terminal buds, however, appeared to be sound. The next thing we considered was freeze damage; but this spring was nowhere near freezing around here. Drought? The symptoms aren’t quite consistent with what we usually see in conifers from drought stress. But the needles really did look scorched, so maybe intense heat was the culprit. Could they have been damaged when they were soft, shortly after budbreak? I went back and looked at the phenology data that I recorded for the two Douglas-fir trees at our office. This spring, the last “NO” I recorded for budbreak was on April 27th, and the first “YES” was May 10th, so budbreak on our two trees actually would have occurred sometime in that two-week window. While there’s variation among trees of the same species, it’s probably safe to assume that the landowner’s trees also broke bud somewhere in that time frame, or perhaps a day or so on either side, since his location is close by. Now for the heat. We had an early heat spell in May, but exactly when was it? For this, I needed to look up temperature records, so I went to the Oregon Climate Service website, which houses records weather station data from across the state (including from OST volunteers!). The nearest station with daily temperature data was ten miles away, at the Scappoose Airport. On May 13 and 14, there was a high of 88 degrees, which ties the record high for those dates. While that’s not considered extreme heat, it certainly is extreme for that time of year. And it happened very soon after Douglas-fir trees had broken their buds. So my theory? The few trees that looked scorched were among the budbreak “stragglers” – that is they were among the last to break bud, and probably did so less than a week before that hot weather. That’s why they were the only trees that were damaged – because their needles were still very young and tender. My theory can’t be proven, but it sure was cool to have the phenology records to back it up in this “sick tree” case. Incidentally, of the three years I’ve observed these trees, budbreak has occurred right around the same date. It will be interesting to see whether they are that consistent every year going forward. On another note, you are reading this as the 2018 Water Year (Oct 2017-Sept 2018) wraps up. By participating in OST, I can easily see how this water year’s rainfall stacked up to normal, without doing the calculations myself. “Normal” in this case refers to a 30-year average, currently calculated from the 1981-2010 time period. 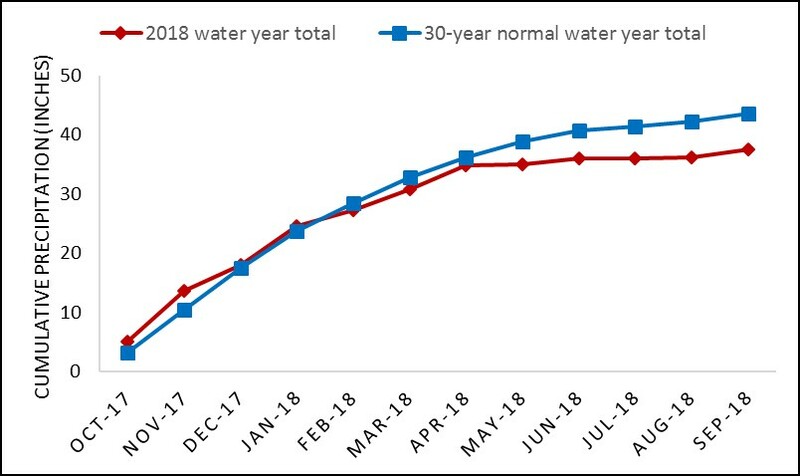 We all know it was dry this year, but here’s the data to show that since May, our water deficit has been slowly getting bigger (data as of Sept. 28th).